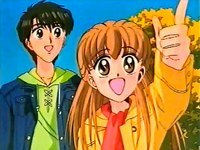 Plot Summary: Seara Arisugawa vowed to become Shuhei Seto's bride when they were still very young despite their three year age difference. Touched by the little girl's initiative, Shuhei tells her that if she grows up to become a beautiful lady, then he might consider her proposal. Four years later, her determination remains unaltered. Seara is now an extremely tall sixth grader still deeply in love with Shuhei. When her parents are about to move to the United States, she finds a way to remain in Japan: move to Seto's house. Despite being not so close acquaintances (Seara's father is the boss of Shuhei's dad), she gains permission and ends up sharing a room with Seto Koharu, Shuhei's younger sister who has the same age as Seara.